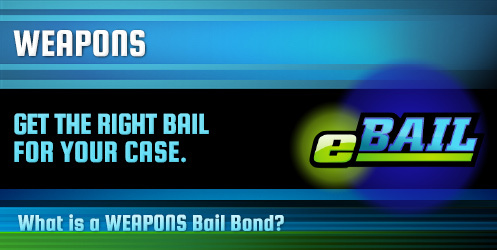 eBAIL provides Fast, Cheap, Online Weapon Bail Bonds in Las Vegas, Nevada 24/7. Also serving Weapon Bail Bonds in North Las Vegas, Henderson, Boulder City, and Nationwide. Facing weapons charges in Las Vegas can be a serious matter. Due to the potential for the time in jail or prison, those facing weapons charges may have their bail amount set at a very high amount, depending on the charges. This bail amount is set as a type of security to be sure that the accused attends the scheduled trial. In order to be released from jail while waiting for trial, this bail amount must be paid. In the alternative, you may consider a Weapons Bail Bond. What is a Weapon Bail Bond? A Weapons Bail Bond allows a defendant to be released from jail while waiting for the scheduled trial without having to pay the full amount of the bail. A bail bond can be purchased at a fraction of the cost of paying bail. Once a bond is established, it is important that the accused shows up for the scheduled trial or the Weapons Bail Bond will be forfeited and the accused will face tougher penalties. Which Jails Accept Weapon Bail Bonds? When arrested on weapons charges, you will be booked into jail to wait on an initial hearing. This is the time when the judge will set a bail amount. Once bail is set, there are different ways you can be released from jail. Pay the full amount. Bail is a guarantee that a defendant will return to court for trial. This money will be returned after the trial less any related costs and fees. However, bail amounts may be set very high in regards to weapons charges. Pay 15% of the bail amount. 15% of the bail amount may be paid to purchase a bail bond from a qualified bondsman. The bondsman will then arrange for the release of the accused from jail. While this 15% cannot be returned after the trial, it is payment for the work the bondsman must do to secure the release. If the defendant misses the trial or other scheduled court hearings, the bondsman is lawfully able to take legal measures to regain the full amount of bail and to secure the defendant’s arrest and appearance in court. Hire a criminal defense attorney. While it may be necessary to hire an attorney for the criminal defense at the trial, a lawyer can also help change the amount or requirements of bail. However, this process may take a few days or weeks to complete while the accused remains in jail. The release process may take anywhere from 6 to 16 hours on average. This time may be affected by circumstances such as weekends, holidays, or difficulties within the jail. The release process cannot begin until bail has been paid or a bond has been established and secured with the jail. eBAIL is fully licensed and accredited to work with jails in Las Vegas and surrounding areas. The bondsmen at eBAIL can find out in which jail the defendant is being held and the amount of bail set by the judge. The courteous and professional bondsmen at eBAIL can help through the bail bond process from beginning to end to help secure the release of your friend or family member. Payment is easy and can even be done over the phone or online, with payment arrangement possible.